But the truth is not clear cut. Tiara is guilty of aggravated assault. Even the detectives can’t find motive to explain her action, which means the judicial system has no choice but to keep her locked up as a dangerous juvenile criminal. Tiara remembers much of her past but she has no idea why she stabbed a strange woman in a coffee shop. Her mental isolation doesn’t allow her to confront this important question. Only the psychiatrist, with the assistance of the detectives who keep digging in the past, might be able to unlock the secret buried in her soul. I need to clarify that I usually steer clear of this subject matter. I am still dealing with lingering PTSD as a result of my own sexual assault(s) in high school. There is a term that we survivors use for things that cause us to have a flashback or nightmares. We call them triggers. And I do want to stress that this book is one major trigger for anyone who has suffered any kind of sexual assault or exploitation. That said, it is right on the money regarding PTSD type symptoms. For that reason, I kept on reading. I wanted to see if the portrayal of Tiara’s symptoms was accurate. Many emotions rolled through me while reading this book. Sadness, anger, frustration, despair. I already didn’t like pagents and I can’t stand to see the tiny little outfits young cheerleaders and dancers wear. This book solidified the fact that my child will never, ever be in a pagent. Ever. I’m sure those who haven’t had similar experiences might find this book informative, and it accurately portrays what survivors go through. But if you can’t stomach lurid details it might be wise to skip it. I was drawn to this book 1) because my husband is Italian and 2) he is from the greater Philly area. And because I love historical fiction. 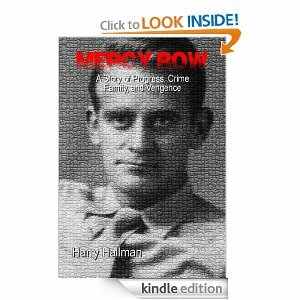 Mercy Row is a novel set in 1920s and ’30s Philadelphia. It is the story of the rise of a North Philadelphia crime family that was also responsible for building the homes and factories that make up this blue-collar area of the city. Despite the violent trials and tribulations caused by rival gangs from South Philadelphia and Chicago, Jacob Byrne and Franklin Garrett, with the help of the Irish immigrants who settled the Kensington area, build a formidable Irish mob. This legal and criminal enterprise kept North Philadelphia free from the mafia for two generations. Jacob’s and Franklin’s organization was built on the blood of those who opposed them, the sweat of the laborers who built North Philly and the tears of the wives and mothers whose loved ones were lost in the struggle. The first thing I noticed about this book is that it is incredibly violent and uses a plethora of foul language. That isn’t a problem from me, as I read zombie books and I’m from the Northeast, where “curse” words are part of the everyday venacular. But I could see how this could put off some readers. But what can you expect from a book about this time period? I was quickly sucked into the world of Jacob, Frank and their associates. I loved the loyalty and friendship between these two. Mr. Hallman’s depiction of these “gangs” is reminiscent of “Boardwalk Empire”. Hallman doesn’t give the day by day activities of this group, just enough info for the reader to get a feel for the characters of Jacob and Frank and how they operated. And the action is relentless. Tommy guns, speakeasies, dames, corruption all feature prominently. The book jumps a decade about halfway through. Not too many books can do this, and keep the flow and overall tone of the book alive. Mr. Hallman does both of these. It was fascinating to see how the gang was set up to transition from bootlegging to other enterprises with the repeal of prohibition. It was touching to see Jacob soften with regard to his family. He was still ruthless when it came to protecting that family, but the entire concept of “Mercy Row” was about the love he had for his daughter. I loved this depiction of Philly. I kept on reading quotes to my husband to get his take on what was written. I’m eventually going to have him read it as well. He will particularly find interesting the entire scene in Oxford, Pennsylvania. The town was described to me years ago exactly as Mr. Hallman has written. Nearly word for word. Overall a quick, entertaining read. It gives an amusing account of this city in the early part of the 20th century. I do hope we hear more of Jacob and Frank and their exploits in the future. On the surface, Iraqi-born Azzam Abdullah is nothing more than the unremarkable head of accounting for what is, by all appearances, an innocuous global conglomerate. What’s not so innocuous is the fact that Sun Corp is one of the biggest terrorism financiers in the world. After years of informing on Sun Corp’s secret deals to the CIA, an unfortunate confluence of events brings Azzam’s covert treachery to light. When Azzam is forced to flee London for America, Sun Corp’s ruthless CEO decides to use a woman from Azzam’s past to flush him out. In a furious race against a heartless zealot’s deadline, Azzam is forced to decide between the life of one innocent woman and the safety of millions. Ms. Mitchell has a phenomenal skill for writing a thriller. 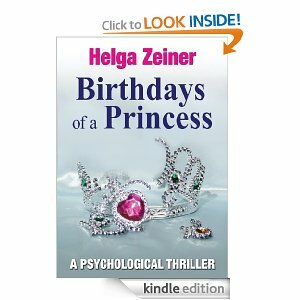 This book was a “page-turner” or as much as one could be on the Kindle. The way she moves from character to character throughout the story keeps the suspense at a high level. She also provides little bits of insight into each character and what motivates them to do what they do. She keeps up this relentless game of show and tell until nearly the final pages of the book when it all falls into place. The characters are very three dimensional. Azzam is almost tragic in the way he risked his life every day for years in order to betray someone that he once viewed as a father. The ruthlessness and inhumanity of these criminals is chilling. It seriously brought to mind the callous and evil way the 9/11 terror attacks were orchestrated. The way in which the terrorists covertly carry out their activities is horrific. The entire set up of a company that funnels money around the world to fund terrorism is probably not far off from reality. I give this book a rating of 3.5 stars. I have no other interest in this topic other than it vaguely relates to current events, and Ms. Mitchell managed to keep my attention and keep me turning the pages. I appreciate her format for a thriller, just enough information to keep it interesting, but not enough for the reader to unravel the entire story until the final pages. I appreciate the portrayal of Azzam, and I do believe that there are individuals out there who make the same sacrifices he made in order to protect innocent lives. Overall, a great read that turns the reader’s preconceived notions of terrorism on its head. Over at “I Read a Book Once”, the gaggle of book reviews answer question about…what else…books! Is there a book that you were supposed to like but you didn’t–for instance, a piece of classic literature or a wildly popular best seller? If so, what was it and why didn’t you fall down on your knees and worship its literary greatness? Through this blog, I have discovered that I like to write. Alot. And apparently my words are readable to other people than just me. In fact, other people actually LIKE my writing. So I am branching out. I recently started writing reviews for another book website (http://www.ireadabookonce.com/). I also have started writing news articles for an online newspaper (http://www.examiner.com/gun-rights-in-austin/amanda-amaya). 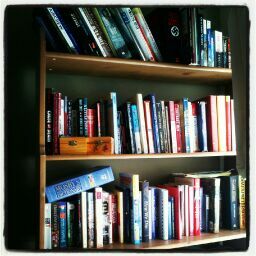 If you like what you see here, head on over to those sites and read more. Hopefully through these venues I’ll be able to write more and more. Because I really like doing this. Alot.